When you go out for a night of dark deep depressing doom the last thing you want to see is the sun beaming down on you with a smile wider than Cheddar Gorge. That was the case at the Asylum though when it was very difficult to adopt the customary gloomy exterior on such a cheerful pleasant evening in Birmingham. The grinding disparate pounding signalled the familiar intro to ‘Demeter’s Grief’, a chilling necro nightmare of a song delivered as always with polish and gentle persuasion by vocalist Soph. Alunah conjure up majestic wispy harmonies but while laced with the essential sorrowful doom ingredients ‘Demeter’s Grief’ has the capacity to ignite, with a frenzied mid-song escapade. The band have a new album out later in the year, via Napalm Records, and we got a taste of what to expect with a new track in ‘Bricket Wood Coven’ before finishing with two angst filled Alunah classics. ‘White Hoarhound’ has a kind of purity running through it with Soph’s haunting cries setting hairs on end but as always with Alunah the sense of evil and the hand of darkness is always within reach. 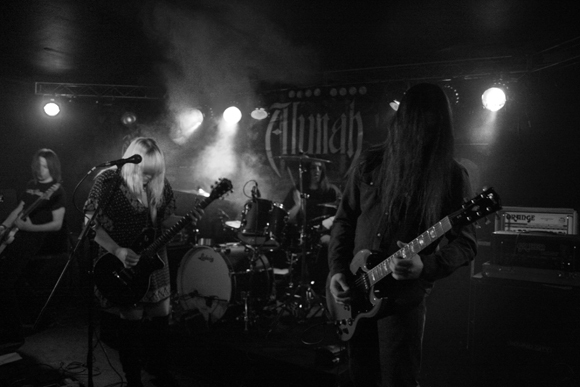 With the Asylum now bewitched by the spells being cast on stage, Alunah closed with the compelling ‘Belials Fjord’. They are back at the Asylum next month along with headliners Purson, on a bill creaking with doom. Having seen Alunah several times the home crowd knew what to expect – that though wasn’t the case with the Richmond rednecks Inter Arma. Well if you didn’t know what these guys were about before they started, they sure as hell made sure you knew them by the end of their exhaustive set. Opening instrumental number ‘Love Absolute’ crawled along at a snail’s pace initially, painting pictures of fluffy wispy clouds, before Inter Arma gradually began to tighten the screw injecting handbrake turns and thumping blasts. Frontman Mike Paparo had to content himself by just stomping around the stage as the sound erupted around him, stomping his feet with increasingly fevered commitment as though trying to squash a tarantula. Once the band moved deeper into this sordid set, mainly built around their album Sky Burial, the vocals kicked in but not so much with introspective tales of doom – but a full on headcharge into the flames of evil. A rasping cry that reverberated off the Asylum walls and the uninitiated could be forgiven for thinking that Paparo had good reason to feel at home in a venue with this name. 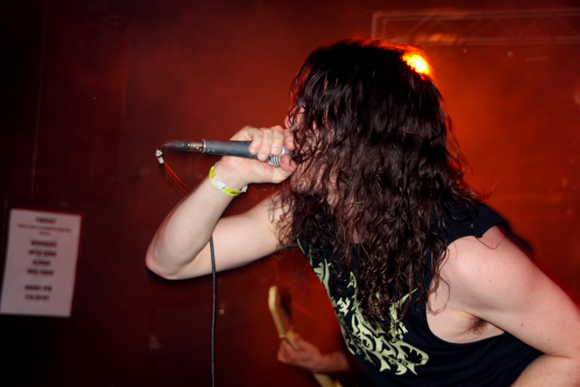 Inter Arma’s suffocating sound is reminiscent in some ways of Bossk mixing majesty and menace to great effect. Having toured extensively around Europe these past few months the band will return to their Virginia homes to prepare for a North American tour in support of Ulcerate. If the antipodean aggressors are the benchmark for extreme music of pure hostility then Inter Arma aren’t far behind them. Headliners Windhand appeared at Roadburn in the Netherlands the previous evening, an indication of just how well their sound has spread over the past year or so. Like Inter Arma, hailing from Richmond Virgina, this was Windhand’s second UK tour although last time around the Birmingham date was switched a few days beforehand to Leicester. So there was much anticipation to see female singer Dorthia in action, and as with the rest of the band, she did not disappoint. Windhand have built a devoted underground following drawn by their trademark melancholic doom laced with a sprinkling of the occult. Unlike Jex Thoth though, Dorthia doesn’t feel the need to hold aloft gothic props to get her message across. Indeed, she took to the Asylum stage casually dressed in a tartan shirt and jeans but having opened up with ‘Winter Sun’ it was clear she still had the dark knights by her side. The initial bass hum to set opener ‘Winter Sun’ was so deep and grinding that any beer glasses left dotted around the confined venue were in danger of bouncing straight on the floor. Such were the vibrations that proceeded to career around the Asylum that it would even have been advisable – a bit like those headspinning rides at Alton Towers – to enforce a ‘no pregnant women’ rule. As the spiraling wizardy riffs took over the effect was to be transported back to some kind of hazy 70s summer day when flares still represented the width of your trouser bottom rather than an illegal smoke swilling device secreted into football stadiums. 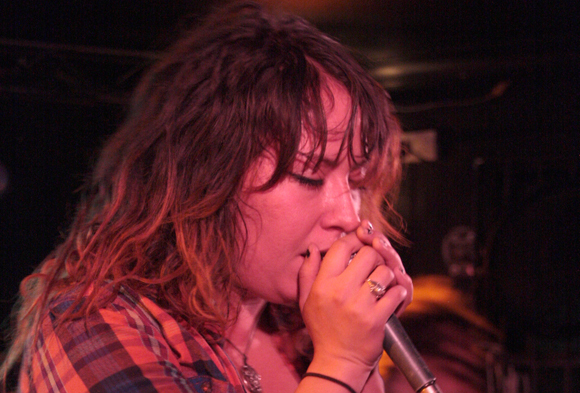 Due to the duration of most Windhand songs, the average setlist only comprises around half-a-dozen numbers. The final two of these at the Asylum were from Windhand’s jawdropping second album Soma, a work of infinite beauty within which dark forces are at work. Dorthia spent little energy, if any, on small talk, preferring to immerse herself in her artistry. To describe curtain closer ‘Cassock’ as a jaunty number at 15 minutes long may be stretching things although it is half the length of ‘Boleskine’ which for obvious reasons the band rarely, if ever, perform live. ‘Cassock’ though is a pulsating example of doom at its scary best, droning deep and dark. Once touched by Windhand the experience is not forgotten easily.